The showroom was inaugurated by Mr. Mohammed Dadabhai, Chairman of Dadabhai Group, in the presence of Mr. John Paul Alukkas, Executive Director, Joyalukkas Group, Mr. Quresh Dadabhai, other dignitaries and various customers. 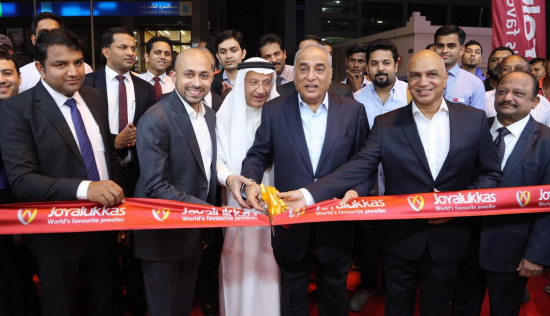 The brand new showroom, strategically located opposite Standard Chartered Bank, Manama, Bahrain promises to deliver the same customer experience one experiences at any Joyalukkas showroom across the world. Joyalukkas will display its exclusive range of jewellery from its in-house brand including Veda Temple Jewellery, Pride Diamonds, Eleganza Polki Diamonds, Zenina Turkish Jewellery, Li’l Joy Kids Jewellery, the Apurva Antique collection & Ratna Precious Stone Jewellery, as well as brand-new diamond collections.